An international team of researchers has discovered what they describe as an inside-out planetary nebula—a planetary nebula with surroundings that are the opposite of what normally occurs. In their paper published in the journal Nature Astronomy, the group describes their find and offer possible explanations for its existence. The researchers note that normally, stars on the smaller side, like the sun, tend to eject a mixture of gas and dust when they get old. This material forms a cloud of electrically charged material. Such cloud-shrouded stars are known as planetary nebula. The researchers note that nebula clouds usually have a layered form—the closest layer is generally made up of heavily ionized helium; the next closest contains less-ionized oxygen, and the outermost region is usually made up of a mix of barely ionized oxygen and nitrogen. But now, the team has found something different—a nebula with a cloud of gas and dust that is the opposite of the norm. The gas in the outermost layer is more heavily ionized than that closest to the star—it is inside out. The researchers note that prior to their finding, it was believed that such nebula did not exist—there would be no way for them to form. But now that they have found one, they have come up with a possible explanation. They believe it is possible that as the star aged, shrinking down to a white dwarf, it had a last gasp of sorts—an explosion that sent a shock wave through the cloud, ionizing the gasses in the outermost region. The shock wave would have had to cool though, before it could ionize the gases it encountered, which explains why those in the inner layers were not more impacted. The team also reports that they went back and looked at historical records of the star and found that it had dimmed considerably over the past 46 years. They suggest this might be evidence of the nebula existing in the middle of the period when its constituent gases were still reacting to the rapid dimming of the star. They note that if their theory is correct, astronomers should see the star become less obscured in the coming years as the dust disperses. Planetary nebulae are ionized clouds of gas formed by the hydrogen-rich envelopes of low- and intermediate-mass stars ejected at late evolutionary stages. The strong UV flux from their central stars causes a highly stratified ionization structure, with species of higher ionization potential closer to the star. 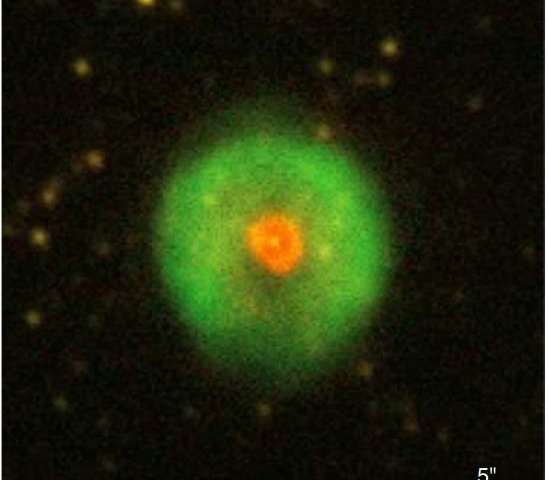 Here, we report on the exceptional case of HuBi 1, a double-shell planetary nebula whose inner shell presents emission from low-ionization species close to the star and emission from high-ionization species farther away. Spectral analysis demonstrates that the inner shell of HuBi 1 is excited by shocks, whereas its outer shell is recombining. The anomalous excitation of these shells can be traced to its low-temperature [WC10] central star whose optical brightness has declined continuously by 10 magnitudes in a period of 46 years. Evolutionary models reveal that this star is the descendant of a low-mass star (≃1.1 M⊙) that has experienced a 'born-again' event1 whose ejecta shock-excite the inner shell. HuBi 1 represents the missing link in the formation of metal-rich central stars of planetary nebulae from low-mass progenitors, offering unique insight regarding the future evolution of the born-again Sakurai's object2. Coming from a solar-mass progenitor, HuBi 1 represents a potential end-state for our Sun. As much as I appreciate science updates, it seems to me that any theory the public comes up with is just as good as science. We fringe theorists are just as right until proven wrong. Its so easy to theorize about something millions of light years away because it can't be proven wrong. Let's try right next door and theorize about the electric sun. "They note that if their theory is correct, astronomers should see the star become less obscured in the coming years as the dust disperses." Real science: Study, hypothesise, make a falsifiable prediction. Funny monkeys! Demanding that the Universe obey your rules. And, every time an outlier, a product of random chance breaks your rules? You have a tantrum demanding that reality conform to your delusions of mastery. Sorry kids, but the reality of the Cosmic Scale is that chaos rule, humans drool! The only reality that matters to us, is at the Human Scale. Can we utilize "temporary" and "local" phenomena to manipulate material existence? If your woo cannot produce a device testable by US Patent Office standards? You are just another flimflam artist! If two smaller stars merged, it would also clear out as the new star has sufficient stellar wind pressure to clear out obscuring the dust. "We fringe theorists" A garden variety nutter does not a fringe theorist make. For one thing their theories are fringe, it's not having no astronomy education. Home schooling by older nutters doesn't count. Nik, haven't you heard? In the post-truth world of Trump, falsifiability is dead! Faith is everything. And solipsism is an indicator of a healthy personality. So, if you can imagine it, and believe in it, and it's in your head...it's real! This is more BS that got him elected where ignorant arses don't like being told by learned people how things work. America's 200 year cultivation of bone deep anti-intellectualism has finally triumphed. And just in time for the information age. Having an uneducated population that can't draw veridical conclusions from data is a lot easier than censoring everything. Why do you think suicides among Boomers are skyrocketing? It's really hopeless. john berry: Trump? Ugh, you're insane.